The Netherlands American Cemetery and Memorial in Margraten is the only American military cemetery in the Netherlands. This honorable site is managed by the American Battle Monuments Commission (ABMC). On the ‘Walls of the Missing’, left and right on arrival, are the names of 1,722 missing soldiers. Beyond the tower on the vast meadow, 8,301 soldiers are buried. Unique to this cemetery is the adoption program, supervised by the Foundation for Adopting Graves American Cemetery Margraten. 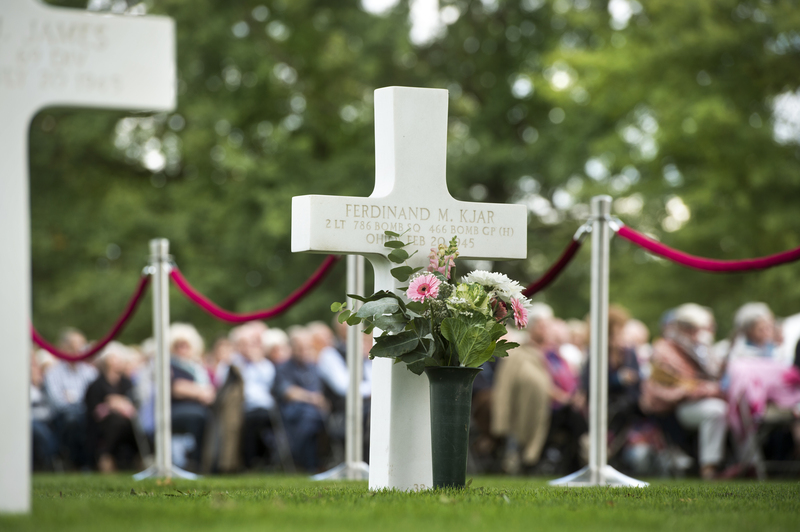 Since 1945 the graves have been adopted and cared for by people in and around the community of Eijsden-Margraten. With the ‘Faces of Margraten’ project, the Foundation United Adopters American War Graves tries, as much as possible, to give a face to these soldiers by placing a photo at their graves and names. Meanwhile, all graves and names on the ‘Walls of the Missing’ have been adopted in a special tribute to our liberators. “Year in, year out I visit the Netherlands American Cemetery and Memorial. The white crosses. The white stars of David. I usually take guests, often Americans who come to honor their ‘boys’. Filled with emotion and respect, they move quietly between the graves. Buried in Limburg soil, side by side, lined up, without distinction in rank and class, rich and poor. Everyone here is equal.